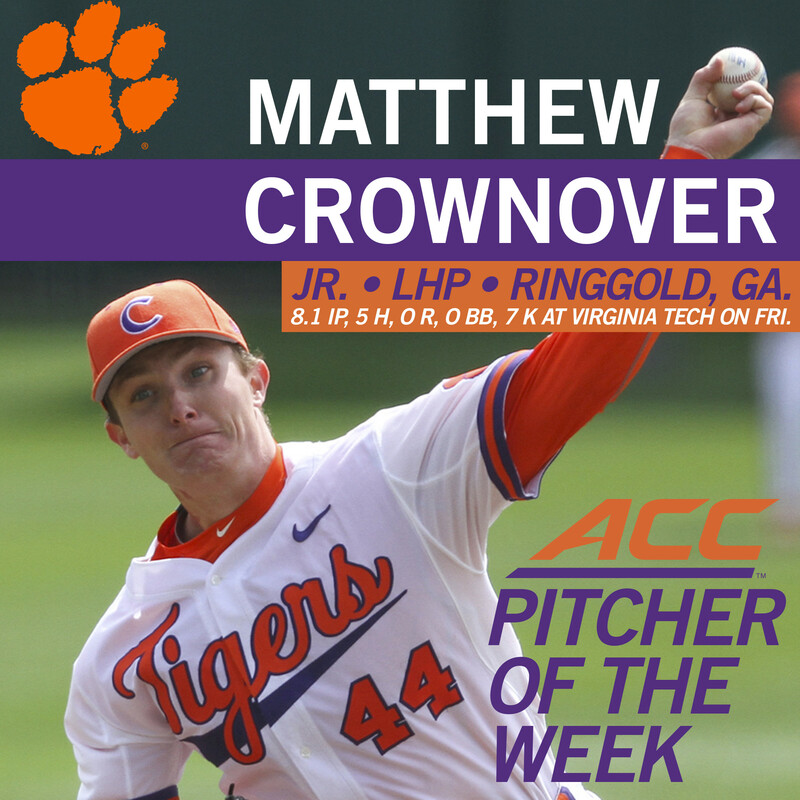 GREENSBORO, N.C. – Matthew Crownover was voted ACC Pitcher-of-the-Week, announced Monday afternoon by the ACC office. Crownover pitched 8.1 scoreless innings of five-hit ball with seven strikeouts without allowing a walk in Clemson’s 4-0 win in 10 innings Friday at Virginia Tech. He faced just 30 batters, five over the minimum during his outing. A junior from Ringgold, Ga., he did not factor in the decision, but enabled the Tigers to win on Chris Okey’s grand slam in the 10th inning. On the season, Crownover is 4-0 with a 1.09 ERA and .163 opponents’ batting average along with 42 strikeouts against only 11 walks in 41.1 innings pitched over six starts. In his two no-decisions (against West Virginia and Virginia Tech), he pitched 14.1 combined innings, allowing only eight hits, no runs and no walks with 15 strikeouts. The weekly honor is the second of Crownover’s career, as he earned the same honor as a freshman in 2013.